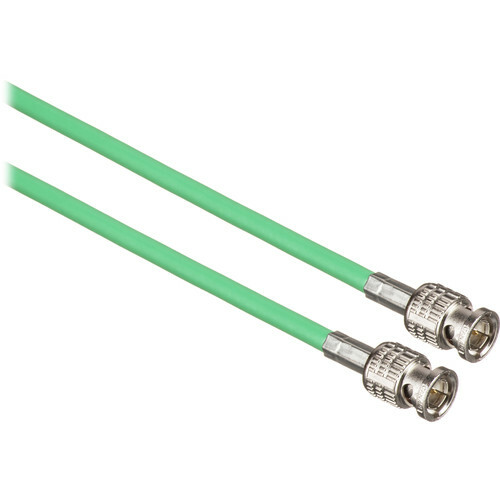 The Canare 1 ft HD-SDI Video Coaxial Cable - BNC to BNC Connectors (Green) is a precision serial digital video coaxial cable that offers throughput for HD-SDI video signals for professional broadcast applications. Thanks to dual copper braids that impart high flexibility and foam PE dielectric insulation, this RG6 coaxial cable can be bent around tight corners or run through tight spaces, while still providing a high-quality, low-loss transfer. Box Dimensions (LxWxH) 5.3 x 5.3 x 0.3"
1 ft HD-SDI Video Coaxial Cable (Green) is rated 5.0 out of 5 by 5. Rated 5 out of 5 by Claudinho from High Quality Trasmition Cable When I needed to attach an external monitor to my BMCC I knew that a kind of strong and durable cable would be the right choice. After reading some reviews about brands I decided for Canare Coaxial Cable and was not disappointed. Once the BMCC has only SDI Output, and I wanted to work with an external refference for tasks like focusing, It's highly recommended to use a BNC Cable instead of HDMI converters due to delay issues in signal. Canare HD-SDI delivers a clear and precise signal with no distortion.The cable is strong and well-built, but it's not as flexible as some users would desire (included me). It's meant to make part of an specific style of mounting with all secondary devices very close to the camera. Perfecto for what I need. Rated 5 out of 5 by BrLi from Cable Looks great I have used the cable a small amount but it looks to be very well made. Rated 5 out of 5 by MRS from Great BNC Cable Going from my Benchmark ad2k+ to my Sound Devices 702. Really like it! Rated 5 out of 5 by BrLi from Good Cable The cable is very well built and I have had no problems so far. Rated 5 out of 5 by jchrist02 from hd sdi 0.3m Perfect size for my bmcc and ninja 2 with sdi converter.